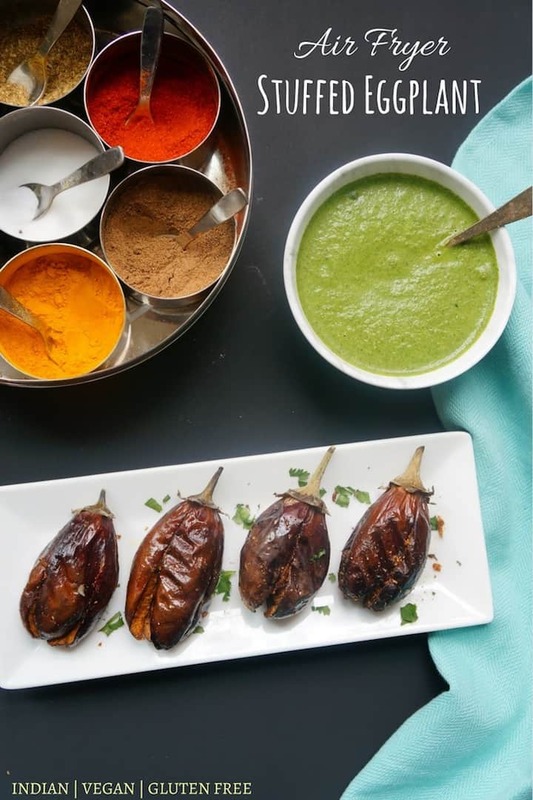 Air Fryer Stuffed Eggplant or Bharwan Baingan is a delicious dish made with baby eggplants stuffed with aromatic and flavorful spices. This is made in the Air Fryer, which gives them a wonderful crispy texture. 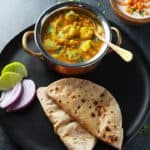 You can enjoy it as an appetizer with chutney, with roti or paratha or as a side with lentils and rice. Did you know? Eggplant is the common name in North America, Australia and New Zealand; in British English, it is aubergine, and in South Asia and South Africa, brinjal. There are many different ways this dish is made in India. I am sharing the most basic one, stuffing the eggplants with just a mixture of spices. This is one of the North Indian styles to make Stuffed Eggplant. Another is to saute finely chopped onions, tomatoes, ginger and garlic along with spices, and then stuffing the eggplants with them. 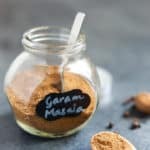 In Maharashtra, it is called Bharli Vangi and the stuffing is made with onions, coconut, sesame seeds, ginger, garlic, spices and a touch of jaggery. In Andra, this is called Gutti Vankaya and the stuffing is made with peanuts, coconut, onions and spices. The stuffed eggplants are then cooked in a tamarind flavored sauce and jaggery powder. So there are really many options to play around with how you make your stuffed eggplants. 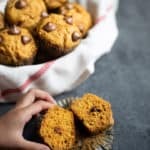 We have been enjoying making these in the air fryer. 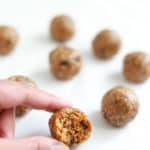 The advantage is less oil and the wonderful crispy texture…and not to forget quick! 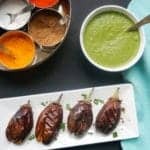 How to make Stuffed Eggplant or Bharwan Baingan in the Air Fryer? The main ingredients for this recipe are baby eggplants, spices and some oil. Wash and then dry the eggplants. I don’t cut the stems as having the stem makes it easier to pick while eating. Apply two cuts starting from the bottom of the eggplant. Mix together all the spices. I used – coriander, turmeric, kashmiri red chili, cumin, salt and dry mango powder. I also added a little garlic powder I got from Trader Joes. Do not skip dry mango/amchur powder as it adds the tanginess. You could potentially replace with lemon powder, however I have not tried it. You can add a little oil to the spices, as that helps the spices to stick while filling in the eggplant. 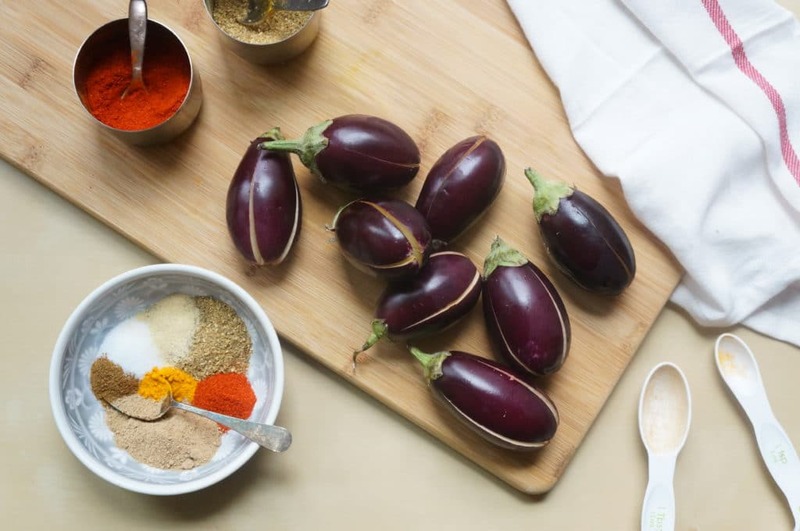 With a spoon or knife, fill spice mixture into the cuts in each eggplant. 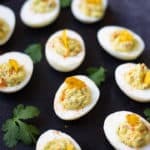 Arrange them in a single layer in the air fryer grill pan or basket. I could fit in 8-9 medium one’s in my philips air fryer. Cook them in the Air Fryer at 360°F for 8-12 minutes. I say a range here, as the time will depend on the size of the eggplants. These babies took about 12 minutes to cook well. Start checking after 8 minutes, and then cook for additional time as needed. As you can see, they look so appetizing! We enjoyed some with Green Chutney and the rest for dinner as a side with lentils and rice. 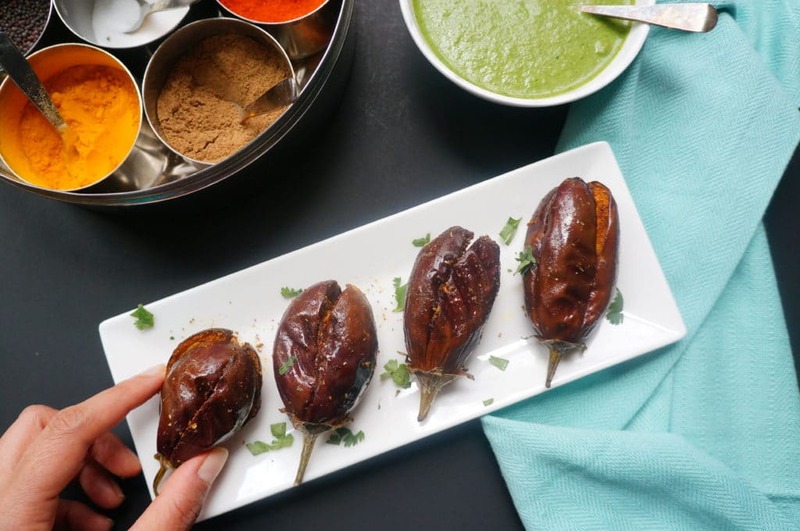 Baby Eggplants stuffed with flavorful and aromatic spices cooked in very little oil in the Air Fryer. A quick and delicious way to enjoy eggplants! In a bowl, mix all the stuffing spices. Take the eggplants and leave the stems intact. Start from bottom of each eggplant and slit in the center till just above the stem. Cut it so that it does not split into 2 pieces. Now turn the eggplant 90 degree and add another slit from the center. Eggplant should be cut in 4 but still held on by the stem. Optionally mix a teaspoon of oil in the spices. With a knife or small spoon, fill spices into each slit of the eggplants. 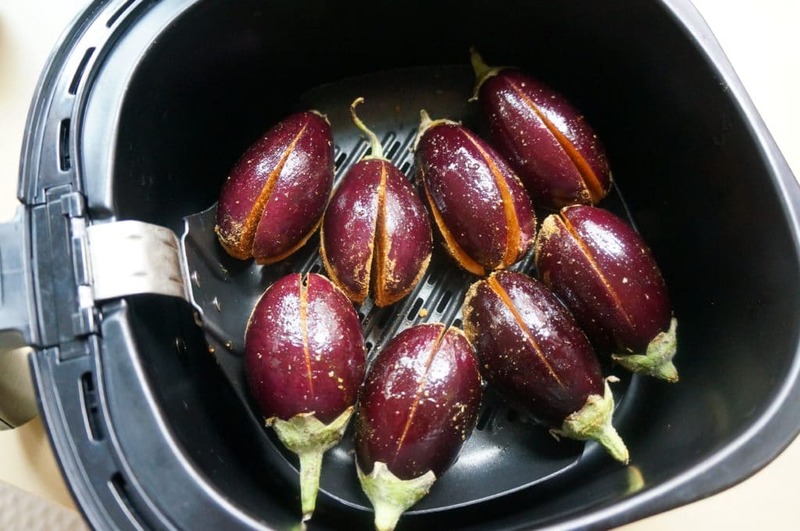 Place eggplants in a single layer in the Air Fryer. Brush oil on each eggplant. Turn around and brush oil on the other side. Start the air fryer at 360°F for 8-12 minutes. Color will be changed when they are cooked. Check at 8 minutes, and cook for additional time as needed. You can turn them around at about 6 minutes, but it is not necessary. Do not skip dry mango/amchur powder as it adds the tanginess to the eggplants. You could potentially replace with lemon powder, however I have not tried it. Cooking time will vary depending on the size of the eggplants. I used medium sized eggplants, which took 12 minutes to cook. For small eggplants, cook about 8 minutes. For larger one's, about 14 minutes. North Indian: Saute finely chopped onions, tomatoes, ginger and garlic in some oil. Add the spices, and get it to a thick paste like texture. In Maharashtra, it is called Bharli Vangi. Saute onions, sesame seeds, ginger, garlic, spices in oil. Add dessicated coconut and some jaggery powder. In Andra, this is called Gutti Vankaya. Saute onions, ginger, garlic in oil. Add spices, dessicated coconut, ground peanuts and some jaggery powder.